Although 3D printing can make some amazing objects, it does have limitations. The list of issues below represent what I have encountered from my own mistakes as well as customer submissions. They have features that are too small, walls that are too thin, or otherwise won’t be duplicated by a 3D printer. (I try to avoid anything smaller than 1 mm in thickness, unless it is a very short distance. Also, thin horizontal features which are not in contact with the print surface will be easily damaged when the support material is removed. They are not modeled correctly. The printer will see the object as an open box instead of a solid. Some of these errors can be corrected if the original model is provided to me, but may require some time to fix. The red area of the model shown below is an indication that the surface will not print correctly. 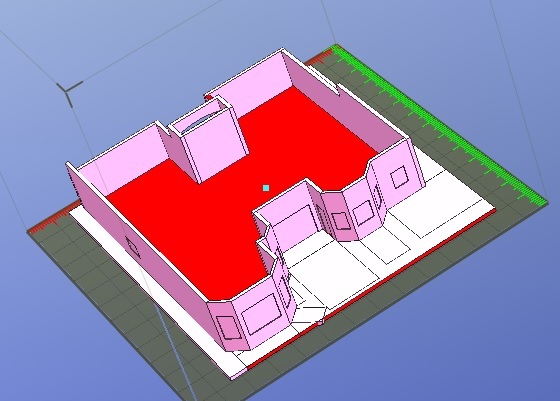 I can usually detect these problems with a thorough STL model review prior to printing. 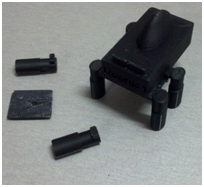 The original design shown at right had several weak areas that caused the part to break when the support material was removed. The round “legs” were attached with tiny attachment areas which broke easily. The “wing’ on top was only held on by a thin rectangle, and easily broke off when the support material was removed between the wing and the body of the part. The other photo on the right shows the part with all support still intact just as it came out of the print process. When designing a part, keep in mind the support material required. Depending on orientation used, support is required if there are any gaps between the part and the base surface it stands on. Angles (greater than 45 degrees from horizontal) can be accommodated. ABS is a common material used for many commercial and consumer goods. It is what Lego toys are made of. I guarantee you already have many products in your home made from ABS. Any small plastic object or one subject to being broken by abuse into smaller parts are choking hazards for small children. Please do not let children play with 3D Printed objects unsupervised. 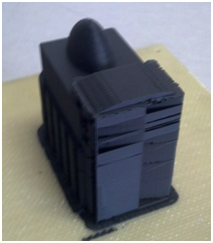 3D printed parts do not typically hold water or keep pressurized air from leaking at slow rates. The part can be painted or sealed to reduce leakage, but this must be provided by customer. ABS is not designed for food contact, although there are now food grade ABS filaments available. If you are concerned about your print being compatible with fluids, see the guide at the following link.